Today’s featured plant is Field Pennycress, Thlaspi arvense. It's in the mustard family (Brassicaeae), so it is related to common garden crops such as cabbage, cauliflower, broccoli, and kale, as well as other wild mustard family plants such as Shepherd’s Purse –Capsella bursa-pastoris – Weekly Weeder #15 and Winter Cress- Barbarea vulgaris – Weekly Weeder #20. Pennycress is native to Eurasia, near the Mediterranean, but has spread around much of the world. The USDA plant database shows it throughout most of the US and Canada, although oddly absent from Georgia. (see map). It prefers full sun and disturbed soils, and is commonly found along roadsides and trails, in garden beds and farm fields. Plants are small to medium height, about 5-18″ (12.5-45 cm) tall, and are most easily distinguished by their small, flat, round penny-shaped seed pods, which turn from green to coppery brown as they mature. The seeds are dark brown, oval, with a point at one end. They have an interesting swirl pattern on them that reminds me of a fingerprint. In the seed pods I broke open, I found 12 seeds, six on each side, divided into two compartments by a papery membrane. The seed pods break right in half to spew seeds all over the place. The plant has a taproot, and spreads by reseeding. Like all members of the mustard family, their pennycress flowers have four petals arranged in a cross shape. They are small, 1/4′ (.6 cm) across, and grow in 1″-2″ (2.5 – 5 cm) clusters at the end of branches. (See photo at bottom of post.) The flowers don't have much smell, but the plant itself has mustardy odor when crushed, and a strong, somewhat mustardy/garlicky flavor. The small white flowers are visited by pollinators, and I'm pretty sure there's a cabbage worm at the top of the pennycress seed pods photo. The nectar of the flowers attracts primarily small bees and flies. The caterpillars of some White butterflies and Pyralid moths probably feed on the foliage, including Pieris rapae (Cabbage White), Pontia protodice (Checkered White), Eustixia pupula (Pyralid Moth sp. ), and Evergestis pallidata (Purple-Backed Cabbageworm Moth). Mourning Doves occasionally eat the seeds of weedy members of the Mustard family. Because the foliage has a bitter-garlic flavor, it is not a preferred food source for mammalian herbivores. When dairy cattle eat this plant, their milk develops an off-flavor. You can eat it, but it doesn't taste very good. 🙂 Seriously, like most wild greens in the mustard family, it has a very pronounced flavor. The bigger the plants get, the stronger the flavor, and once they've bloomed, you'd have to be really hungry. Cooking takes the edge off, although you can use very young greens in salads if you like a little extra kick. Hot radish eaters, this is the salad green for you. Extracting Seed Oil For Cooking and Lighting: 1) Pan roast seeds. Stir constantly until seeds are well toasted. 2) Allow them to cool. 3) Place the seeds upon a flat, smooth rock (being a survival situation) and use a second rock to crush them into a paste. 4) Fill container with water and put seed paste inside. 5) Bring water to a boil. When the oil rises to the top, skim the oil off the top with a spoon (or carefully pour it off) and place it in a second container. Note: Survival Plants Memory Course states that internal use of this plant may deplete the white blood cell count. To be on the safe side, consult a trained herbalist for internal use. They do recommend it as a leaf poultice for bug bites and stings. Simply chew and apply to affected area. The plant contains sufficient quantities of glucosinolates to be toxic. During dry periods, cattle in western Canada have ingested hay containing high quantities of stinkweed, or field pennycress. Poisoning, death and abortion occurred. Tests of field pennycress showed that the allylthiocyanate (a glucosinolate) content is sufficient to cause sickness and death in cattle. Fatalities occurred at about 65 mg/kg of body weight. The amount of this chemical varies with the stage of maturity of the plant, the highest amount is in the seeds. Cattle that ingested hay containing between 25-100% field pennycress were colicky and some abortions occurred. Ensiling hay containing field pennycress apparently prevented liberation of allylthiocyanate. A little may be good, a lot can cause problems. The entire plant is anti-inflammatory and acts as a blood tonic and blood purifier. It has agents that induces sweating, agents that induces the removal (coughing up) of mucous secretions from the lungs. It is fever-reducing and promotes the well-being of the liver and increases the secretion of bile. The seed is a tonic. Both the seed and the young shoots are said to be good for the eyes. The seeds are used in Tibetan medicine and are considered to have an acrid taste and a cooling potency. They are anti-inflammatory and fever-reducing, and are used in the treatment of pus in the lungs, renal inflammation, appendicitis, seminal and vaginal discharges. Field pennycress was used medicinally by the Iroquois Indians. They made an infusion of the plant taken for sore throats. Pennycress also has a broad antibacterial activity, effective against the growth of staphylococci and streptococci. BioFuels Manufacturers of Illinois is working with farmers and researchers to develop pennycress from “weed to wonder-fuel”. Their ideas are outlined at growpennycress.com. No additional fieldwork is required from the time of planting to harvest because no insecticide or herbicide applications are required for a successful Pennycress crop. As a member of the mustard family and a winter annual, insect pressure is insignificant due to its natural chemistry and the temperatures of the growing season thus limiting an insecticide requirement. 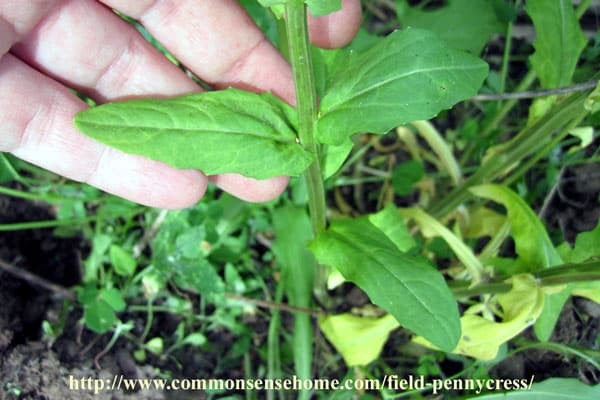 By germinating in the fall after the typical summer growing season, competition from other plants as weeds is very limited and spring stands of Pennycress out-compete emerging summer weeds. 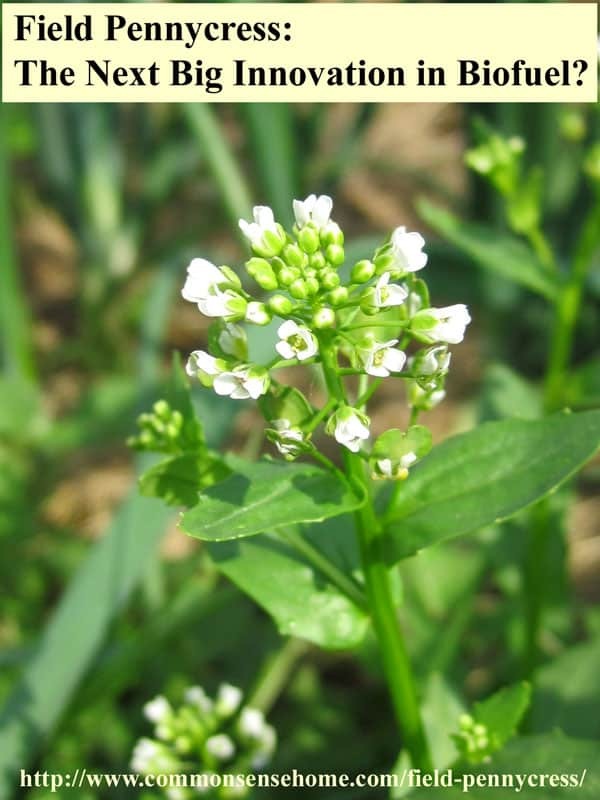 Thus, Pennycress also acts as a potential and effective weed suppressant. The seeds can be harvested cleanly, with good yields per acre, and increase the yields on the soybeans that follow them. 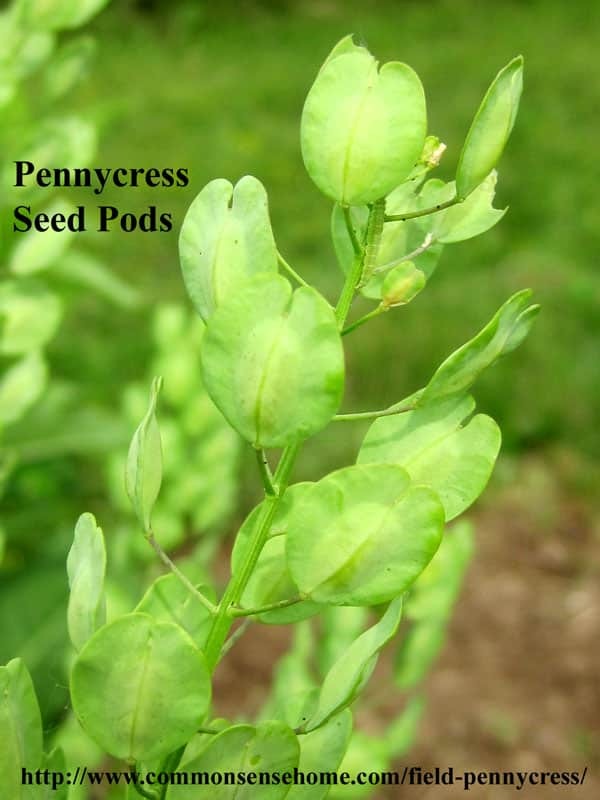 The Pennycress Project states: “Pennycress has fewer chemical and energy inputs and produces twice the oil per acre as soybeans.” That sounds like a very promising biofuel crop to me. Great article and you are spot on. I am in the process of commercializing Pennycress as a feedstock oil for production of biodiesel. My goal is to construct a 30 million gallons per year facility in Michigan. 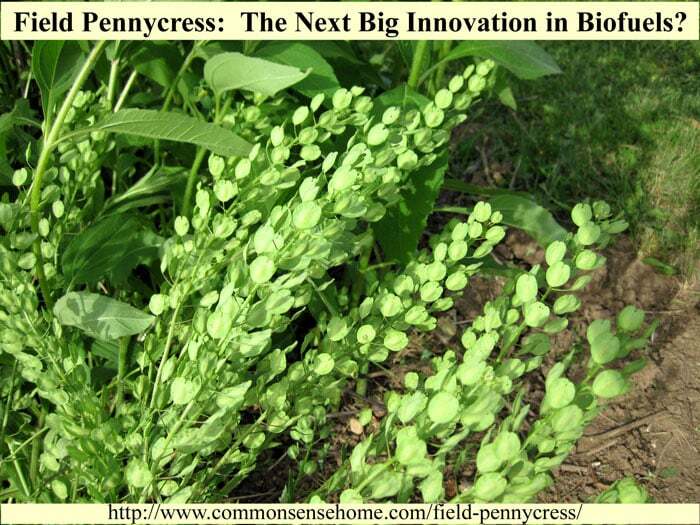 I want to have farmers grow the Pennycress as an over winter cover crop in rotation with soy beans. We will pay the farmers for growing the seed. Presently, I have perhaps 25 farmers who are earnestly interested. We will next crush the seed and extract the oil and sell the oil to the biodiesel producers. I am currently contacting biodiesel producers and have received a very positive response. 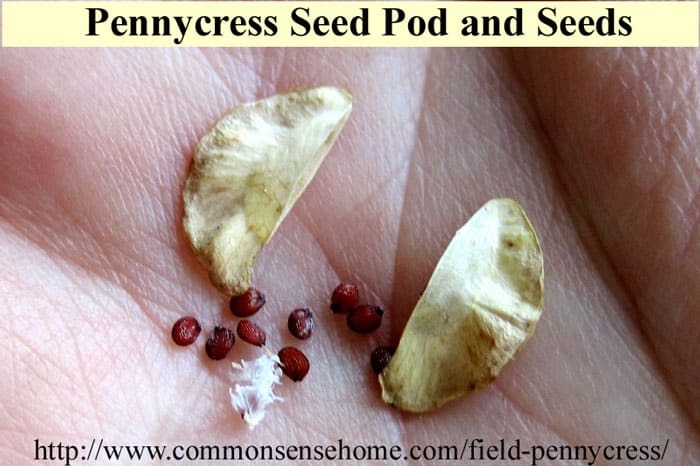 I would be appreciative if you would be kind enough to notify me if you prepare of come across other current articles on Pennycress. Thank you. Interesting. I haven’t seen much information on the topic, but hopefully that will change.